Joining on the couch on a hot, yet stormy Melbourne evening, is an author who loves a good horror story or thriller, Stuart Byng. Thank you, Stuart, for taking the time to chat to me. Please sit down, get comfortable and let’s begin. His primary interest has always been writing, something that he has been doing on and off for most of his life. 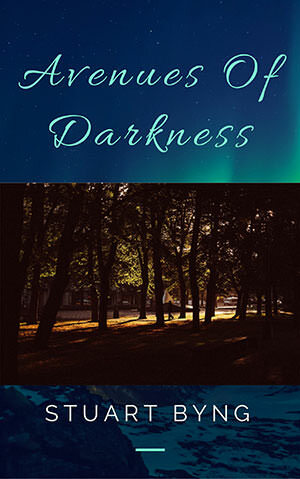 His first novel, Dark Minds, was self-published a few years ago, followed by Avenues Of Darkness, in August 2017. Both are currently available from Amazon. He is currently working on another novel titled Kito, due to be released in the summer of 2018. Ideas surround us all the time. From things we see, or that happen to us. It is taking these ideas and developing them into your story that is the difficult part. Still writing lots I hope! I would like to have a minimum of 20 titles published by then. Yes. I began writing stories from quite a young age, although they were not in the horror genre then! I have always enjoyed writing. I would say that it has taken a bit too much of a back seat at times though. The best advice I could give is to read and write a lot. It really is the only way. There is no shortcut to becoming a writer. The most important thing is to write as much as you can. I do read reviews but I do not reply to them. They are an individual opinion and it is not for me to try and change that. Obviously I do prefer the good reviews! Editing the first draft can always be tough. It is a difficult yet necessary process. It can be hard to cut parts of your own writing out, but it is necessary for the good of the story. I would prefer not to limit a story by saying yes to this. However, I hate all kinds of animal cruelty so unless essential, I would prefer not to write about that. Generally speaking, the ideal time to complete the first draft is 3-6 months. This doesn’t always happen in practice though. I am currently working on my novel Kito. Hopefully it will be released this summer. It does with every writer I would say. It is from our environment that we learn things that later can come as ideas while we write. It is what makes a person who they are. A quiet cosy room, with a comfy chair and a desk. Nice and simple. My aim is always to take the reader away from everyday life for a while. Come with me and enjoy the journey! Horror and Thriller books have always been a favourite of mine, so it was a natural choice. I have always enjoyed reading, from a young age. It is the way you can lose yourself in a story, whatever else is going on just fades away. That is amazing, and I hope my stories allow others to do the same. I have been writing on and off for over 20 years. Too much off time has meant not as many books released as I would have liked. I aim to change that from now on. I would have to say Kaleb from Dark Minds. Very interesting to write about due to the freedom you can have with a supernatural type of character. My characters are imaginary. However, as we all draw on our own experiences for writing, I believe that they are made up of a variety of people I have known, read about, or been told about at some time in my life. I find silence is often best. Although some music (my particular favourite is UB40) can be good, as long as it is only in the background. Stephen King is definitely my favourite author. His character development and detailed plots are top class. He has a great ability to draw a reader into the story. Avenues Of Darkness is out now!